THANE: With the mercury levels rising above that of Mumbai, ecological experts from Thane blame it on rampant urbanization and decreasing green cover coupled with its distance from the coastline. Over the past few days, the heat wave that hit the Mumbai Metropolitan Region (MMR) caused a rise in the maximum and minimum temperatures by over six degrees Celsius. However, throughout this period the temperature recorded in Thane city has been consistently higher than that of Mumbai, thus leaving citizens baffled. “One of the reasons we purchased our home in Thane five years ago was because it was greener than Mumbai, and we felt that this would ensure a more pleasant weather. The rising temperatures and decreasing air quality, especially over the past few days has completely rubbished that notion,” said Souradeep Ghosh, a Lodha resident. Meteorologists asserted that this difference between the mercury levels of Mumbai and Thane could be because of the cooling down of the hot winds as it goes further south. “The heat wave over the past three days was a result of the intensification of the northern hot winds because of the anti-cyclonic condition over south Pakistan. As these hot and sultry winds move south, the temperature marginally drops. 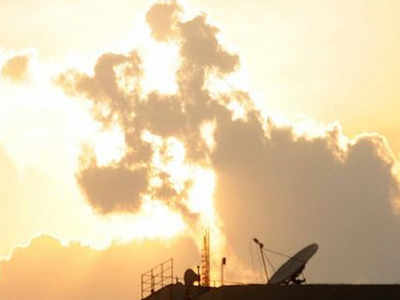 While different regions generally have different weather based on their topography, the reason for increasing variation between these neighbouring cities is probably because these winds cooled down by a degree or two as it passed from Thane to Mumbai,” said Mahesh Palwat, senior meteorologist at skymetweather. Acknowledging that this could be one of the reasons for the disparity between the weather of the sister cities, city environmentalists and urban planners point out that the rampant deforestation and urbanization has further widened this gap. “The temperature may drop marginally as the winds move south, but not by three to four degrees Celsius. Even if we consider the higher humidity levels in the coastal island city it would not make this big a difference. So either there is some variation in the method of recording the temperature by the TMC and the IMD or the natural cooling system in the city has been messed with,” added a member of environmental organisation Paryavaran Dakshata Mandal.